Princess Noriko of Takamado is the second daughter of the late Norihito, Prince Takamado - a cousin of Japan's Emperor Akihito - and Hisako, Princess Takamado. 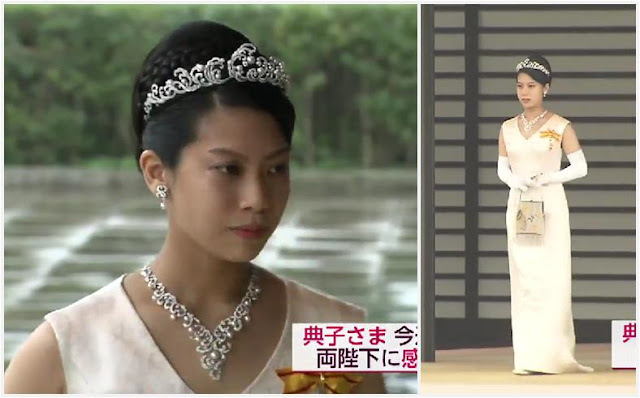 Noriko's coming of age in July 2008 was marked with the creation of a new tiara, as is the tradition of the Japanese imperial family. Created by Japanese jeweler Mikimoto, Princess Noriko's tiara features diamond scrolls in a wave format curling around white pearls, with an asymmetrical center wave. Like other new tiaras commissioned by the imperial family, the Wave Tiara was part of a full set of matching pieces (a parure), which included a necklace and earrings with small wave motifs and pearl pendants. The wave motif is used gently in this tiara, a soft reminder of an island-appropriate theme also seen in more dynamic pieces like the Boucheron Wave Tiara, which takes its inspiration from the iconic artwork The Great Wave off Kanagawa by Hokusai. I'm not a big lover of asymmetry in tiaras, but for this one, I'll gladly make an exception. 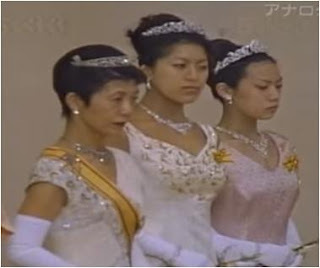 It's a refreshing change from the absolute and often overwhelming symmetry present in the rest of the Japanese imperial tiaras, and it interprets the wave motif without getting too literal. As for her tiara? It's probably awaiting use or reconfiguration. Unused imperial tiaras sometimes pop up again as additional options for women still active in the family, and there are other tiaras suspected to have been created by redesigning past diadems. I hope we'll see the Wave Tiara again in its present form, because I do think this one is a highlight among the Japanese princess tiaras. Are you liking this version of an asymmetrical tiara?